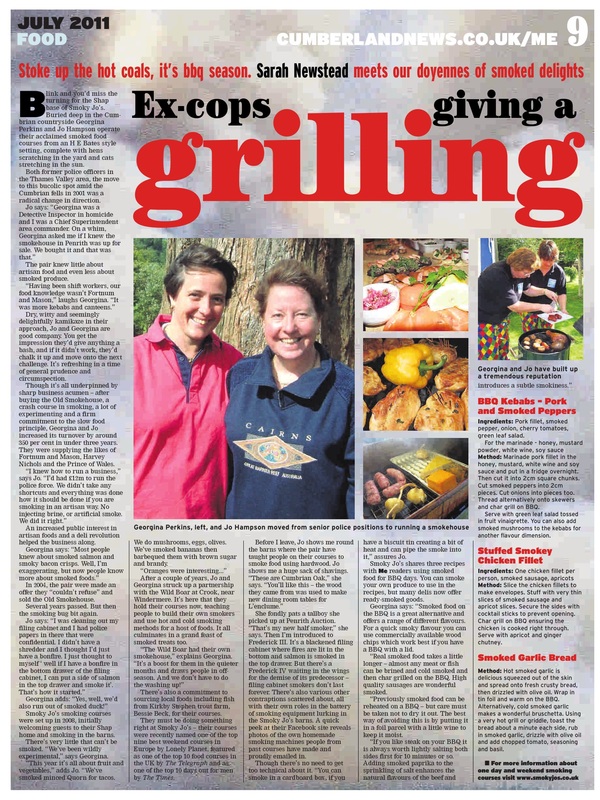 This article appeared recently in The Cumberland News – written by Sarah Newstead, we think it really captures the spirit of Smoky Jo’s! The text is underneath, if it’s a bit scratchy to read in the picture. 350 per cent in under three years. Nichols and the Prince of Wales. injecting brine, or artificial smoke. the smoking bug bit again. in the top drawer and smoke it’. home and smoking in the barns. smoked minced Quorn for tacos. We do mushrooms, eggs, olives. months and draws people in offseason. Bessie Beck, for their courses. shows me a huge sack of shavings. picked up at Penrith Auction. offers a range of different flavours. a BBQ with a lid. sides first for 10 minutes or so. sauce and put in a fridge overnight. Then cut it into 2cm square chunks. pieces. Cut onions into pieces too. and char grill on BBQ. cocktail sticks to prevent opening. chicken is cooked right through. tin foil and warm on the BBQ.